Home » Windows » How To Solve Ten Most Common Errors In Windows 8? Windows 8 error messages rarely describe what you did to cause the event or, even worse, how to fix the problem. Following are some of the most common Windows 8 error messages, notifications, and just plain confusing attempts at conversation. Find a message that matches what you’re experiencing and then read how to handle the situation as gracefully as Windows 8 will allow. Probable cause: A window similar to the one shown appears when you try to install or update a driver for one of your computer’s parts. Solutions: If you’re sure the file is safe, click the Install button. But if this message appears unexpectedly, or you think it may not be safe, click the Don’t Install button. Meaning: You haven’t saved your work in a program, and your work is about to be lost. Solutions: Look in the window’s title bar for the program’s name. Then find that program on your desktop (or click its name on the task-bar to bring it to the forefront). Finally, save your work by choosing Save from the program’s File menu (or tab) or clicking the program’s Save icon. Don’t want to save the file? Then click Don’t Save to discard your work and move on. Meaning: The dialog box appears when Windows doesn’t know which program created the file that you double-clicked. Probable cause: Windows programs add hidden secret codes, known as file extensions, onto the ends of filenames. When you double-click a Notepad file, for example, Windows spots the file’s secret, hidden file extension and uses Notepad to open the file. But if Windows doesn’t recognize the file’s secret code letters, this error message appears. 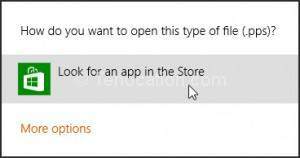 If Windows doesn’t offer any valid suggestions, however, choose Look for an App in the Store. You may need to download or buy an app from Start screen’s Store app. Meaning: When the built-in Windows 8 antivirus program, Windows Defender, finds a potentially dangerous file on your computer, it lets you know with this message. Windows Defender then removes the file so it can’t harm your computer or files. This particular notification looks identical on both the desktop and the Start screen; it always appears in the screen’s top-right corner. Probable cause: A dangerous file — malware — probably arrived through e-mail, a flash drive, a networked computer, or a website. Windows is removing the file so it can’t do any harm. Solutions: You needn’t do anything. Windows Defender has already caught and removed the evildoer. Meaning: When this window appears, tell Windows what to do with the flash drive or memory card you’ve inserted into your computer. Probable cause: You’ve just slid a flash drive (a stick of memory) into your computer’s USB port, or you’ve put a memory card, perhaps from a camera, into a card reader attached to your computer. Speed Up My System (Windows ReadyBoost). Click this only if you plan on leaving the item permanently attached to your computer. On slower computers that need more memory, this option can speed them up. 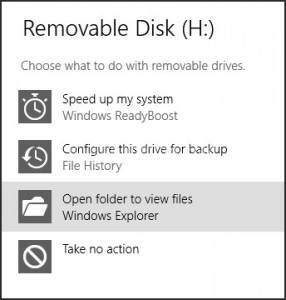 Configure this Drive for Backup (File History). Click this to leave the item permanently attached to store backups. With a large flash drive, it works fine with File History. Take no action. Clicking this simply gets rid of the message. To access the item later, open File Explorer from the desktop, and open the card from there.See the letter listed after Removable Disk in the message? That’s the letter of the drive Windows has assigned to your item. Meaning: You must sign in with a Microsoft account to perform several tasks in Windows 8. If you don’t have a Microsoft account, you’ll see this message. Microsoft accounts let you reap the most benefits from Windows 8. Probable cause: You may have tried to use the Mail, People, Calendar or Messenger app, which all require a Microsoft account. You also need one to download an app from the Microsoft Store. 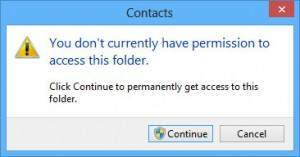 Meaning: If you see the dialog box shown here, it means Windows won’t let you peek inside the folder you’re trying to open. (The folder’s name appears in the message’s title bar.) A similar message appears when Windows won’t let you peek inside a file. If an account holder wants to let others see inside the file or folder, he or she should copy or move the item into the Public folder. Windows: If you’re having problems with a Windows 8 Store app, Microsoft offers a few troubleshooting tips and a utility that can automatically find and fix app problems for you. Most of the time, the Windows Store will automatically tell you if there’s a problem with an app and will try to fix it. However, some Microsoft support forum users are reporting Windows 8 errors such as failed Windows updates, and apps not working after upgrading from Windows 7. Microsoft’s troubleshooting advice include trying to update the app, sync its licence or re-install it by going to Store > Settings > App updates to update or sync licences. To re-install the app, swipe down on or right-click the app, and choose to uninstall it, then download it again from the Windows Store. 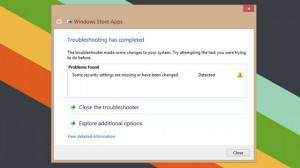 An easier automated option is to just grab Microsoft’s Apps troubleshooter. When I ran it, the utility found some missing security settings I didn’t even know about and automatically reset them for me.